If you become a member of a Timebank you earn time credits for the time you spend helping other members. One hour of exchange earns you one time credit . With these time credits, you can exchange for something that you need.  What is a Timebank and how does it work? If you don’t need all the Credit you earn, you can save them up, donate them to someone you know or give them back to the “community account” so that the people who run the project can make sure the members who are unable to earn Credits get all the help they require. A Timebank recognizes that many people don’t like the idea of accepting charity but like to feel useful and able to offer something back. A Skills Exchange provides the opportunity for this through working on a basis of reciprocity – everyone has something to offer and neither age nor mobility need exclude anyone. This kind of exchange is not new – it has traditionally occurred among families and friends. All a Skills Exchange does is to provide a new structure for neighborliness, one that turns goods deeds into real purchasing power. » escorting people on errands and appointments. » shopping or doing errands for people. » doing simple housework, minor home repairs or gardening. What if the service I want isn’t listed? Go find someone to provide that service. Recruit that skill, and the next skill provider, and the next one. This will enrich your service menu for everyone! What if I'm not satisfied with the service offered? Example: I didn’t like my haircut. What would you do if you paid cash for that haircut? Same thing. Talk to the provider. Express your opinion, work out a solution. Treat the situation the same as you would in the cash economy. Can professional people join our Exchange? You know– lawyers and therapists, etc.? Of course. There is room for everyone to feel equal…give equally….receive equally. Exchanging is wonderful because it lets fall away the hierarchy of classist thinking. The beautiful garden I planted for the doctor is equal to the doctor’s examination of my skin disorder. We are each offering something of value to the other person; thus, we are valued equally. Can Non-Profit Organizations join too? You betcha! The non-profit organization has to offer services and provide services. This is the same rule as for every other member. Everyone fits in this model– Everyone. Can one go into debt? Sure, We allow debt. We recommend capping member debt at 25 hours. The same is true with credit. If one is only earning time, and not spending time, then there is no flow… no current. It’s important to earn and spend Time. That’s why we call it CURRENCY. Is this economy a threat to the cash economy? No. Why should it be? It’s a complementary currency. Many businesses see the value in becoming Exchange members. They get amazing marketing benefits, loyal customers and can save cash Euros in starting or supporting their operation. We’re not competing, we’re cooperating! Can people who can’t earn credits still get help? Yes, they can use time credits donated by other participants of the project or earned on their behalf by their family and friends. However, it is important to remember that time banking is about developing reciprocal services amongst participants so ultimately strengthening communities and rebuilding neighbourhoods. At the end of the day most people will find they have something to offer and can provide a service that is valued and needed by someone else. Can I give my credits away? Yes you can. In this way you can help a person twice. Firstly, when you provide a service for a person in need, and secondly when you pass on your credits to someone else to enable them to get some help. However, it is important that people use some of their credits because that is what enables a real community of mutual help to grow strong. Everyone’s hour is worth the same which makes our Timebank a straight exchange. The primary objective is to develop a stronger sense of neighbourliness within communities and the exchange of Credits is a means to that end. Is Exchanging the same as barter? No. Barter is based on the cash economy in a one to one relationship. Example: a plumber and carpenter agree to each provide €1000 worth of work on each other’s homes—that’s the cash world. In the Exchange Economy the services are based on TIME, not cash. Each service hour is valued the same and they are exchanged within a network, not one to one. How can you trust anyone? Get to know them, just as you would with any other relationship. People are people whether they are in the Exchange or not. There are also many features built into the software that allow you to assess the connectedness of another member. If in any doubt, only use the inbuilt communications methods rather than arranging to meet someone over the phone, as there are records kept of all emails sent from within the system. Please note, our admins will be made are of emails and their content that are sent through our system, but not any replies. If you have any questions or need clarification, then please get in touch. Can anyone be a member? Anyone can be a member providing they accept that the primary aim of our Timebank is to develop closer communities and recreate a sense of neighborliness through the methods of exchanges. The idea of give and take is the driving force behind our Timebank and members must be willing to both provide and receive exchanges to enable everyone to have an active role within each project.